It’s time for another Be Inspired Design Team Blog Hop – what fun! The Be Inspired Design Team is a group of Stampin’ Up! demonstrators from all over the world who are excited to share our themed projects with you. I’m honored to be a part of this group of talented stampers. The theme for today’s Be Inspired Hop is “My Favorite New Stamp Set.” What fun! If you aren’t starting the hop here, then you probably just popped over from a visit with my Aussie friend (and super-talent) Louise Sharp at louisesharp.com. She never disappoints! 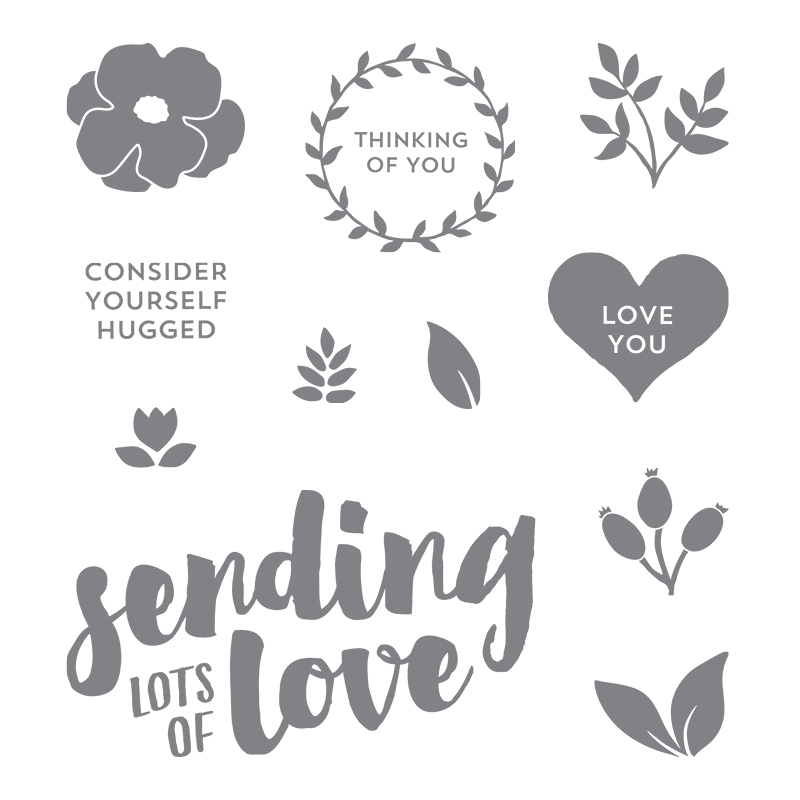 Lots of Love, Stampin’ Up! Lots of Love. This “sending lots of love” is a funny sentiment – whether it’s a casual greeting or formal greeting all depends on how you decorate it. When I was in grade school, we signed our letters (the ones we passed in class) with “LOL” – at the time, it meant “lots of love.” With playful colors or fun, graphic paper, this sentiment could be sent, for example, to give a friendly shout out to your bestie. The soft colors and floral patterns I used on this card, though, make the same sentiment more formal – appropriate for the loss of a loved one or even a wedding. I love how versatile this gorgeous sentiment is. Layering with Fresh Florals. I’m LOVING the Fresh Florals Designer Series Paper Stack. Although we’ve seen these patterns before (in last year’s Floral Boutique Designer Series Paper), they are like new in these 2017-2019 In Colors. I adore the watercolored wash across the pages and that there are four patterns in each color (two of the patterns have a white pattern on a colored background, while two have a colored pattern on a white background). That makes them PERFECT for beautiful layers on a card! Simple card, beautiful card – simply beautiful card! LOL Brian! Love this card AND I love this stamp too! Brian, the beautiful DSP and font really make a stunning card. I’m loving the size and font of the sentiment. I have a stash of DSP that I need to use, so thanks for the great inspiration today. Enjoy your day! The sentiment is gorgeous layered on the floral pattern. The black really pops against pink! In love with this card! The papers and layers are magic.